Let’s face it; it’s tough to get excited about the need to clean your carpets. At Assured Services we understand how you feel. So we try our best to make this process as seamless for you as we can. It’s our desire to get in and do the job efficiently with as minimal “downtime” to you and your lifestyle as possible. Every great carpet cleaning experience starts with a proper pre-inspection. Our service specialist will inspect your particular areas of concern as well as noting carpet construction and soiling conditions. He will also advise you of any possible permanent staining. Please let us know if there are any areas of special concern we should be aware of. Your carpets will be thoroughly vacuumed to remove bonded dry soil. We utilize high filtration vacuums that capture 99.98% of the allergens removed from your carpet, helping the indoor air quality of your home. Effective removal of dry soil is one of the most important steps in cleaning. Sofas, chairs and tables will be carefully moved. Larger pieces, beds and dressers are left in place under our regular pricing structure. Furniture legs will be insulated from the freshly cleaned carpet with disposable blocks and tabs. Should you have a special request for moving an item we normally don’t, please discuss this with our office at the time of scheduling. Once the soil has been loosened, our state-of-the-art truck-mounted hot water extraction process will thoroughly flush the carpet pile, removing soil and the applied cleaning agents. Our system is regulated so that carpet is cleaned within the warranty requirements of virtually all carpet mills. We clean with water temperature between 180 °F – 190 °F. Every carpet that we clean is pH balanced so that there is no sticky residue left behind. This treatment is used as a rinse, or applied after the rinse, depending on soiling condition. Your carpets will feel soft and fresh. We do not apply any fragrances to your carpet during our process. We think that a clean, fresh carpet smells better than chemicals sprayed on it that may give you the “perception” of clean. If any spots are not removed during the cleaning process, specialty spotting techniques are employed. Note: Permanent stains identified by our service specialists may not be removed. Some carpets benefit from a post cleaning dry bonnet process. Dry bonnet assists in faster drying and prevents wicking on some carpets. 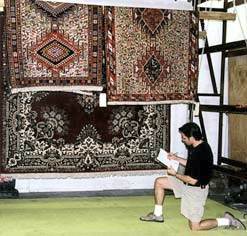 Your specialist will determine if your carpet requires this process. High velocity air movers are placed on the carpet to speed dry carpet. The carpet pile is set with a carpet groomer for faster drying and visual appeal. Our specialist will go over the end result of the job with you and notify you on any non-cleaning correctable situations that may exist. 1. A pile lifter and vacuum is used to remove as much dry soil as possible. 3. After thoroughly rinsing the rug and cleaning the fringe, the rug is hung to dry using accelerated air flow.